The ware for April 2018 is an SAE 316L stainless steel cerclage currently embedded in my right kneecap. There’s also a pair of 2.5mm holes drilled lengthwise through the patella, and a set of sutures woven into my quadriceps, neither of which show up in an X-ray. The hardware is to repair a double-break of my knee; I simultaneously suffered a patellar avulsion fracture and a tear of the quadriceps tendon. It’s rare to get both injuries at once, but hey why do anything half-assed. As for how it happened – well, you’ll have to believe me that it’s just from falling while walking on flat ground. There was a puddle of greasy/soapy water outside a hawker stall and boom, I’m unable to walk for months. I wish I had some cooler story, so that’s why I had this month’s competition – to try and find a better bar story. To that end, gratz to perlfriend for the most imaginative story; email me for your prize! This was my first time going through major surgery. I’ve previously had some minor patches and cuts, where I only used local anesthesia and watched the surgeon perform. As a hardware guy, I think your body is the most fascinating piece of hardware you’ll ever own so I don’t miss an opportunity to take a peek inside when maintenance is required (to clarify, I find it totally gross to watch other people’s surgeries, but somehow when it’s my own body its different – my sense of wonder overtakes my aversion to blood). So I’ve never been put full under before. When the anesthesiologist came to interview me, I asked what my options were for local anesthesia. She then tried to convince me that general anesthesia is very safe because they have this computer running some complicated algorithm that considers my weight and height to dose me correctly. Besides the fact that they had to estimate my weight because I couldn’t stand on a scale, my inner monologue was screaming “As a hardware engineer, putting my life in the hands of a computer sounds terrifying” but instead I manage to ask politely, “and what happens if the computer has a problem?” At which point she smiles and re-assures me that she’s constantly monitoring my vital signs and trimming the dosage. Side note, a friend of mine later on pointed me to an article where apparently some infusion pumps have Wifi that’s on during surgery and the protocol is pathetically hackable. OK, medical equipment makers: there’s some equipment that simply should not be IoT, and an infusion pump is absolutely one of them. There is simply no valid reason for the computer attending to the dosage level of a potentially fatal chemical to be spending any cycles answering TCP packets. Death by DDoS is not an acceptable scenario. If you need to push an update, do it by a USB disk or a plug-in Ethernet jack, so they can at least air gap the damn thing during an operation. Had I known about the wifi vulnerability of anesthesia infusion pumps, I probably would not have consented to general anesthesia, or at least asked to check that the model they were using had no IoT capability. But the anesthesiologist finally convinced me under the argument that the local procedure would require sticking a needle into my spinal cord and withdrawing cerebrospinal fluid, and I’m like, I don’t know what that is but it sounds important for my brain to work and I kind of like my spinal cord intact, so maybe it’s not worth the risk. I’m in the recovery room, and my surgeon is there giving me the post-op interview. About 2.5 hours of my life went by and I had no memory of it. Sure enough, no nausea or dizziness – the anesthesiologist did a good job. I was lucid and talking to the surgeon about the operation. Then, maybe about five or maybe fifteen minutes later, my body goes into shock – I’m shivering uncontrollably, and I’m starting to become acutely aware of the pain in my knee. Apparently, during the surgery, I was given Fentanyl and Ultiva, both potent opioid painkillers. They give it to you because even though you’re out, your body has autonomous responses to pain that can complicate surgery with excess bleeding and so forth. From what I read, both clear pretty quickly, so I’m guessing the onset of shock corresponded with the painkilling effect of the injected opioids wearing off. 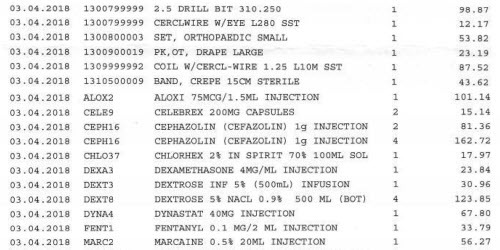 I know exactly what drugs and equipment they used because at the conclusion of the surgery I was given a detailed itemized bill of everything involved; above is a tiny sample of it. It was fascinating to reverse engineer the surgery from the BOM. That’s how I knew they used a 2.5mm drill bit, how I knew they put a breathing tube in me, and that I also got injected with Aloxi to help suppress nausea. I actually sort of wish I knew about the drill bit ahead of time, because I would have asked to keep it. I figured they’re throwing it away so getting the surgical-grade 2.5mm bit that was used to drill holes in my body to use later on to drill mounting bosses would be pretty neat. Just for the record, the overall hospital bill including surgeon’s fees, surgical materials, OT rental, recovery ward, drugs, X-rays and my first round of physiotherapy was about S$20.7k, or US$15.5k at the prevailing exchange rate. This is considered expensive by Singapore standards, as I went to one of the nicer private hospitals for the operation, but as I understand it is quite cheap by US standards. Fortunately my insurance covered all but about $350 of it. This was also my first time using opioid painkillers in a serious way. I’m deeply concerned about the addictive nature of opioids, so I don’t take them lightly. I had taken Vicodin once before when I had a wisdom tooth removed, and I remember it having the effect of “moving the pain sideways” – it felt like the pain was just outside arms length, so I could ignore it if I wanted to, but I definitely knew it was still there. Knee surgery was about a hundred times more traumatic than getting a wisdom tooth removed, and for the first day there’s a terrific amount of pain. So they gave me Targin, which is a mix of oxycodone and naloxone. Targin is a clever way to manage opioid addictiveness. Oxycodone is the opioid; naloxone is the stuff they use to treat opioid overdoses, and it blocks the painkilling effects. Nalaxone is mixed in with the oxycodone to prevent mis-use (crushing & snorting or injecting), and naloxone is poorly absorbed through the digestive system, so when taken orally the oxycodone can still work. For a short time. When the surgical painkillers wore out, basically all the pain receptors in my knee were screaming at me and informing me rather viscerally about what I already knew intellectually – that my knee was cut up, had holes drilled in it, wired up with stainless steel, fibers woven into the muscles, and stitched back together. So I got one dose of Targin, which kicked in in about 20-30 minutes. The oxycodone effect was pretty strong – the acute pain just went away, everything felt okay and I drifted into sleep…only to be woken up about 2-3 hours later by the pain in my knee, presumably due to the nalaxone component finally kicking in and suppressing the opioid effect. However, I was only allowed one Targin pill every 12 hours, and thus had only acetaminophen to manage the pain until the next scheduled dose. It was definitely manageable with some distraction, but there was no way I was going back to sleep again. I could see how oxycodone could be addictive; everything just seemed so okay despite everything being incredibly wrong, so I’m grateful they mixed it with nalaxone and administered it such that my final memory of the trip was being clobbered with my knee pain rather than a lingering desire for more. Of course, the pain doen’t end in 24 hours, but they “graduated” me to a weaker painkiller, Ultracet. The Ultracet is a mix of Tramadol and acetaminophen. Tramadol itself really kicks in only after it’s processed by the liver into desmetramadol by the enzyme CYP2D6, and I’m heterozygous for a copy with reduced activity. I guess that might explain why when I took the prescribed dosage of two pills it was reasonably effective, but when I halved it to one pill I felt almost nothing at all. Overall, Tramadol was less effective at painkilling and more effective in just making me feel a little dizzy and sleepy. In addition to binding to opioid receptors, it’s also a seratonin releasing agent, a bit like MDMA. So during the daytime I would just deal with the pain by distracting myself with work, and at night time when trying to fall asleep, I’d take the Ultracet and sleep like a baby – I was sleeping almost 12 hours a night for the couple weeks after surgery, which I think was extremely helpful in my recovery. Significantly, Tramadol doesn’t quite suppress pain; like my one experience with Vicoden, it turns it into a fact I’m aware of but can deal with. When I would sleep, my dreams would be deep and lucid, but my brain would often reference the pain in my knee and ascribe it to some random weird dream explanation, like trying to go in for a big penalty kick in a soccer game over and over again. Fortunately, Tramadol didn’t feel like it had too much of an addiction risk for me – the awake-state “high” was a bit unpleasant, as I don’t particularly enjoy the dizziness or drowsiness. It was more of a sleeping aid, as it allowed my mind to let go of the pain in my knee while falling asleep. I was finally able to wean myself off painkillers entirely and fall asleep drug-free about two weeks after the operation, but in a weird way I ever so slightly missed that really sound sleep I’d have while on them. Opioid painkillers are no joke. They’re absolutely essential for dealing with pain, but take them with discipline and caution. While the story behind the accident itself wasn’t very interesting, I did find going through the surgery, healthcare system, and drugs to be an interesting learning experience. This entry was posted on Saturday, May 12th, 2018 at 8:00 am and is filed under name that ware. You can follow any responses to this entry through the RSS 2.0 feed. You can leave a response, or trackback from your own site. Bunnie, how did you find out about your CYP2D6 status? I have very little reaction to Tylenol 3 type drugs , so I suspect i am a poor metabilizer but my doc won’t sign for the test. There’s a few services that will test for hundreds of thousands of common genetic variants for a low fee. 23andMe and Ancestry.com will both do it. You then have to download the raw variant file, and then go to a third party service like promethease.com for interpretation (or download the open source tools and run the analysis yourself). Lucky that you were in Singapore. In the US all those line items on that hospital bill would have not only been in US dollars, but the decimal point would’ve been shifted right. To reflect on your concerns about opioids, I broke an arm a bit over 20 years ago and was given max amounts of opioid pain killers (it was a bit of a mess but cleaned up nicely). I never noticed any addictive effects, though I was a bit taken back when I was sent home from the hospital with nothing but Ibuprofen to rely on. I can strongly suggest Naproxen in place of Ibuprofin as I have myself used it at prescription strength for extended periods to treat tendonitis (your results may wary). Prescription strength is double the OTC (4 pills per day, instead of 2). It had been an awesome day at 12,000 feet running some gnarly chutes when my buddy suggested we try out the ridiculously narrow couloir we saw on the way up the last time. I made it halfway down, but then hit a rock that was hidden by the snow. It snapped me sideways and popped my knee in the process. On the upside the injury happened at the end of the season so I have all of northern hemisphere’s summer to recuperate.